Can you possibly discern the origin of this architectural figure. It is confounding me since I cannot find anything in the books that I have for reference. 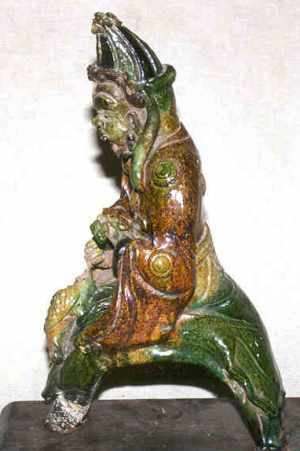 It seems to me that this is a warrior figure and in his lap appears to be a bird. Can you dicere anything from these photos? You call it an architectural figure and that is about as close as we can get. They are usually called "tiles" and were used on the roofs to ward evil sprits off the houses. In the trade they are usually called "Ming dynasty" and everybody seems pretty happy with that provided they are not still warm from the kiln. You could look at the clothing of the figure, the general style, the crazing of the glaze and the general condition - since something that old ought to be at least a bit battered - but regarding the age there is really no telling by just looking at a picture. Regarding the man and the bird I think that could be connected to an old story about a local king that - losing a war - got tied to the roof of his house until a bird took him away. Unfortunately I don't remember the details. The setting of the story was probably the Zhou dynasty. This specific figure is usually depicted *sitting* on the bird, though.